A criminal test case has found the practice of selling cars that remain registered to a third party ‘keeper’ to be illegal. In the case of Regina (House of Cars) v Derby Car and Van Contacts Ltd, Derby Crown Court before HHJ Burgess on 12-6-2012 certain common practices by new car brokers were declared illegal. “In summary, a private prosecution was brought against an Internet car broker for engaging in a commercial practice that was a misleading omission, contrary to Regulations 6 and 10 of the Consumer Protection from Unfair Trading Regulations 2008. “The Defendants sold cars to consumers but registered them initially in the name and address of a third party company in order to obtain a ‘fleet car’ discount from the car manufacturer. “A consumer that purchased a car from the Defendants would own and use the car from the outset, however the vehicle would not be DVLA registered in the consumer’s name and address until a period of 4 to 6 months had elapsed. “The Defendants failed to warn purchasers that during this period they were at risk of being prosecuted for an offence under section 43C of the Vehicle Excise and Registration Act 1994 (as amended) or that a claim made against a car insurance policy might be prejudiced by the commercial practice. DERBY CAR AND VAN CONTRACTS LIMITED TRADING AS UKCARBROKER.COM) was convicted of ENGAGING IN A COMMERCIAL PRACTICE THAT IS A MISLEADING OMISSION, contrary to regulation 10 of the Consumer Protection from Unfair trading Regulations 2008. Always insist on your new car being registered to you the day you receive the car or as soon as is reasonably possible afterwards, certainly no longer than a week adfterwards. Always pay your deposit on your credit card. Carefully consider exactly who you are paying any money to before paying it. Openly ask the broker about whether a new car will be registered in your name as the 1st registered keeper. If you buy a car originally registered to someone else, even if has only for a matter of a few days, insist on it being re-registered to you immediately after purchase and certainly within 7 days. Be aware that any pre-registered car whether bought directly from a dealer or via a broker is a '2nd hand' car in the eyes of insurers who offer new car replacements of 1st hand cars in the event of a total loss. Mention Section 43C of the Vehicle Excise and Registration Act 1994 to reinforce you know your rights. This case did not find selling Pre Reg cars to be illegal, it only found not informing clients there were buying a Pre Red deal to be illegal . This story is completely one sided and does not seek the representation from the industry on both sides, it only covers the side from Drive the Deal who are one of Honest Johns longest advertisers! Drive the Deal will only ruin their own reputation and credibility by twisting the truth like this, Its just so obvious they want to get us to beleive they are the company we should buy from...shame on you Drivethedeals. The last two cars my partner and I bought on line were both registered to dealer or broker before we became the owners and they arrived on time and were exactly what we ordered. I though the distance selling law protected me when buying online anyway which is something that doesnt apply if you buy a car at a dealership. The only thing i do is make sure i pay my deposit for anything i buy online by credit card as this means you are protected by the credit card company thats about the only thing in the above scare story I can see that has any truth to it. If critics of this news item send me their e-mails I will send them a PDF of the full judgement from which they will see that selling a car without transferring the keepership to the buyer is, in fact, illegal and if the buyer uses the car on the road it also renders the buyer open to prosecution. If you think the judgement is wrong, then take your case to a higher court. In the meantime, the judgement in Regina (House of Cars) v Derby Car and Van Contacts Ltd, Derby Crown Court is law. There is an entirely separate issue as to whether manufacturers discriminating against one group of buyers in favour of another (fleet discounts v/s private buyer prices) is legal under current EC law. But the argument over that will always be that a buyer purchasing any goods in bulk is entitled to bargain for a lower price than someone who buys a single item, and always has been. It may be possible to find "unfair terms" in contracts between car manufacturers and dealers, but, again, that is another issue. Three brokers who used to advertise on HJUK went bust owing money to customers. HJ so what your saying then is dont trust brokers? What about all the new car brokers advertising on your site? Are you saying because three brokers closed owing you money that all brokers are dishonest or guilty by the fact they are a new car broker? Are all the brokers that advertise really cheap cars at huge discounts better than dealers saving customers thousands of pounds on this website will have something to say about this. I bought my last car from a new car broker via your website and i found the service very good and I dindnt have to pay for the car until it was on the road outside my house. Everything worked out for me thanks to a Car broker on your site. What about all the motor dealers that have ceased to trade in the last few years does this mean we cannot trust them as well? I dont get your statement at all? changed you and your fellow brokers will have to take the case to APPEAL. than that meted out to Kevin Overton. As long as the broker-dealer tells the comsumer before they place a deposit that there could be a very small risk between the day the car is recieved and the original log book updated they have done as much as they can do.The judge has stated NO ONE has ever been in trouble since 1994 when this law joined the other million offences in the book.You have more chance of been charged for driving whilist on the mobile!!! Provided that the customer has a declared all the facts and has a legal interest in the car they will be able to obtain suitable insurance cover. The company I work for regard any risk so insignificant that we would pay out in all circumstances.Some companies will not insurance I admit but this is down to customers trying to buy a car with large discounts then writing it off themselves to make a nice profit on the new for old scheme. We in this industry are amazed at your remarks on this matter.To actually write "you and your fellow brokers will have to APPEAL." Amazes me as these's dealer-brokers etc are YOUR CUSTOMERS as they have been advertising on your web site for years and I bet you are not cheap! When I stumbled across this and I had to read the story a couple of times to understand what I was reading. As we all understand, there are many laws in the UK that could not be practically enforced. 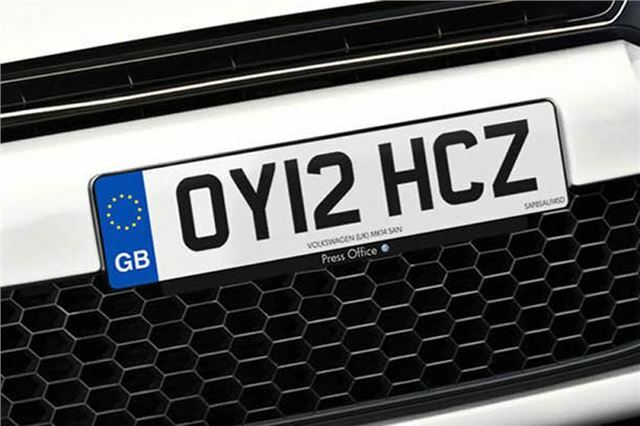 The requirement of a vehicle to be registered in a new owners name at the time they buy it being one of them. Think about this carefully, you buy a car privately, you agree a deal and drive away. The logbook has not been changed at the DVLA, this is why you have a new keepers supplement. Exactly the same if you buy a used car from a motor dealer, unless they had to tax the vehicle for you. What about contract hire vehicles, or day hire vehicles, these are never registered to the 'keeper' either. because it has two owners on the logbook (known as the V5). - maybe someone should tell Glass's Guide, CAP or Parkers to provide a guide price reduction for number of owners? pay more for your insurance. - sensationalist rubbish, how can a lease vehicle be insured if that is the case? I had a lease vehicle and simply told the insurer this was the case and the insurance premium was exactly the same. this could be a very serious situation for you. -- of course not telling your insurer a material fact could invalidate your policy, again irrelevant. DTD did seem to gloat in the fact that 'they' prosecuted a rival, when in fact this totally pointless action cost the public £100,000!! If we are looking at pointless laws we can argue the fact that DTD appear to be ignoring the EU Cookie law, for which they had over 12 months to make the legal changes. It does not come as a great shock that a business may seek to gain a commercial advantage over another in this way, but wasting £100,000 to do so is a real kick in the teeth for the public. HJ, perhaps it would be wise to distance yourself from companies who seek to gain advantage in this way? Or perhaps at least take a stance with a fuller perspective? I think it is clear from the comments seen above, and from the clear admission that trading standards saw no reason to take this up, that perhaps DTD is not the 'gentleman' you describe them as? On a separate note, it is quite a shock to find a commercial website in such a state as the DTD one in 2012? Perhaps HJ will not have to worry about any association for much longer if DTD cannot afford to update its commercial site to make it user friendly and arguably legal? I have always been an advocate of HJ, and will continue to be so. I have to say the hat may have slipped a little with this one though! Seems to me that HJ has been 'got at' by Drive the Deal, the number of references to their deals on the website is extraordinary, and far more exposure than any of the other brokers gets. The practice of pre-registering cars has been going on for years, irrespective of whether it is registered to a broker, a dealer or a fleet company - the practice saves people thousands of pounds on their cars, myself included, 3 or 4 cars over the years all pre-registered - saved a fortune!! I agree with Martin Jones, I think punters who have had cars supply this way will be dismayed by HJs handling of this subject!! Loss of respect!! Also, bad taste for a broker to take legal action against another, what happened to picking up the phone and talking a grievance through!! written to this blog. But I’m willing to review it. Thank you. Just read this article, very interesting. I work for a Renault main dealer and we pre register cars all the time in exactly this way to get Manufacturer bonus and we have never had a problem. The customer gets a cheaper car and we send them the V5C in the usual way. I think this broker Drivethedeals is going to ruin his own business by publishing this garbage. The article suggests the driver of a new vehicle would have a problem but i have been working at dealers for 15 years and they all do this preregistering of cars and i have never heard of any customer losing money by the gap in insurance time between buying a car and then waiting for the V5C. It may be techically illegal from the ruling i dont know but I think Driversthedeals is making a mountain out of a molehill by creating this story. Looks like a scare story which is going to backfire on Drivethedeals and having just looked at their website its terrible. I dont understand why Drivethedealers has sued a competitor anyway, who does that? They obviously think they are the moral customer crusaders or something but it just makes everyone in our industry look stupid when brokers start suing each other to score points. Dont think anyone would take advice from a broker who behaves like this but I always look at the HJ website as it keeps on top of what other dealers are offering. HJ, you forget to mention that Drive the deal have stood up in court and declared they carried out the same practice for years before realising the short falls of selling cars in this way. It is also important to note that the judge stipulated that since 1994 no one has ever been prosecuted. Diane J makes the point that main dealers register and sell cars in this manner all the time, however, they are not brought into this debate. In fact the judge recognised that this was an industry wide practice and hence hailed it as a test case. Looking at Drive The Deals website and adverts on your site I note that they advertise prices which are subject to some sort of dealer finance being taken. Is this right and correct? surely if a consumer sees a price than that should be the price they pay! Lets not forget we are in a recession and without new car brokers, customers would be forced to stick with what they have or pay over the odds for a car. I didn't need to mention this. It's clearly stated in the Judgement. Not only might the consumer now have to pay millions more £££ when buying a new car so drive the deal can make a little more profit but the taxpayer would have had to cove the legal costs to take this case to court at around £100k as trading standards decided there was not a case to be had. The only person who might gain from this is the lawyers !!! As I see it, the victim of this ridiculous case has done nothing more than fallen foul of failing to make customers aware that there is an extremely unlikely risk of prosecution when driving a car which is not currently registered to them. I have checked and there is not a single case where a customer who bought a pre registered has ever been prosecuted - not even a warning. As for whether an insurance company might not pay out a claim because the car was pre registered (and the V5 not in the policy holders name at the outset), is extremely unlikely to occur. Admittedly, some insurers insist on the policy holder being originally named on the log book but this is generally where new car replacement is offered instead of a cash pay out in the event of a total write off. To suggest that this situation applies to all insurers is utter nonsense. Go on a comparison site and you will see! How on earth would the thousands of customers driving cars on personal contract hire agreements or contract hire go about obtaining car insurance when clearly the V5 will be in the name of the relevant contract hire provider and not the policy holder? I work for a franchised dealer group and have supplied literally thousands of pre registered cars to our retail customers where their name has not originally appeared in the log book (V5). We actually change the registered keeper details and post them on 90 days after original registration date. Everyone in the trade is aware that although dealer groups are not supposed to sell pre registered (or self registered) cars due to the “Supply of New Cars Order 2000”, the truth is ALL dealer groups I know go through the process of self registering cars (usually to achieve our manufacturer targets and associated bonuses). Well why wouldn’t you if your competitors do that and then sell their own pre registered cars before 90 days has elapsed? Finally - here is the bitter irony. Once we have hit our manufacturer targets in any given quarter, it is the car broker network (or bucket shops as I call them) to whom we look to sell these surplus cars once we have hit our registration targets and received the associated manufacturer bonus. We need brokers and brokers need us – you know – just like insurance companies need insurance brokers! Have you ever wondered why some insurance brokers appear to have cheaper deals than going to the insurance companies themselves? Have you ever wondered why some travel agents have cheaper deals than going directly to the tour operators themselves? HJ - Car brokers pay as little as possible for our surplus cars and then only add a small margin of profit as they simply do not have the same overheads as us dealers. Most brokers I know are generally ex motor trade in any event and know the system – just like insurance brokers and travel agents understand their industry with their commissions and intro fees. For goodness sake HJ – wake up! Why are you even running this story? Conclusion? – HJ is a either shareholder in the plaintiffs company or extremely naïve in running this story which does nothing than imply that we in the motor trade are up to no good! Just reading through all these comments and I can only come to the conclusion that HJ must stand for "Hand-Job"
I see the copy of the "Derby Crown Court Judgement" which has now appeared to back up your advertiser Drive the Deals story has no County Court Stamp on it! HJ & DRIVERTHEDEAL - THIS IS NOT A COUNTY COURT JUDGEMENT DOCUMENT! I do not think the document is a stamped County Court judgement form and as such to post this on your website telling the public this is a County Court document is completely misleading and it should be removed from this website immediately. Looks to me like a document that has been prepared by Drive the Deals barrister to reflect the events at the County Court and this would mean that it has been written from the prosecutions perspective. I think you have been manipulated by Driversthedeals HJ. This "Judgement" is like asking the German people to comment on the Greek debt Crisis! New Car Brokers save customers money and help keep new car prices at main dealers competitive which can only be a good thing for the new car industry and more importantly its good for the CUSTOMER! A summary of this "Judgement" would be better served if it were independent and objective and not a document masquerading as a judgement written by Drivethedealers counsel. Customers can still buy preregistered cars as the judgement does not render the sale of preregistered cars as unlawful, it is clear this fantasy judgment has been twisted to suit the purposes of Driverthedealers. I am sure the car buying public are more interested in keeping car prices as low as possible rather than listening to Drivethedealerers and their Solicitors trying to scare customers into paying a higher price for a new car. As one of the other posters said, No customer has ever lost money as a result of buying a car on the internet and this appears to be a manufactured "Red Herring" to try and sway customers away from buying cars on the internet. Looks like a classic case of a bitter company, Driverthedeal trying a bit of internet terrorism by bullying another internet broker on a minor technicality. Also reading Irfans comments below about the Costs of this Driverthedeal case being over £100k just makes me even more annoyed that such a Non Issue was actually paid for by the tax paying public! Well done to Driverthedeals for that bit of inspired work, NOT! It would be interesting to see if Driverthedeals could come up with some examples where customers had actually lost money by buying a car on line. As far as I can see new car brokers and discount companies save people money and this is just an attempt to panic everyone into going down to their local dealers to pay the full retail price for a car! Makes me wonder what Dealer Group Driverthedeal are being sponsored by as surely they are going to limit customer choice and competiveness in the marketplace by persuading customers to ignore online new car deals. No sane company operating as an Internet Car Broker like Driversthedeal would risk £100k+ on such a non issue which could potential damage their own business so what else would motivate someone to spend and risk so much money on a what if/possible scenario? D T I = Anticompetitive price fixing. Surely the escalating Price of Petrol is a bigger issue than a theoretical potential "Risk" to a customer over paperwork being processed by the DVLA. Perspective please HJ and think of your customers Driverthedeal as this is a shocking manipulation of a non issue for commercial purposes. No wonder several other dealers are posting such annoyance at this shameful behavior. Talk about crap where you eat! Er, Factoryford. A County Court tries civil cases. A Crown Court tries criminal cases. This was a criminal case. The "defendant" was fined £500. If you are in any doubt as to who the "defendant" was, read the court lists and you will see that the defendant was clearly named. Look at the bottom of the judgement and you will see the words, "Case report approved by HHJ Burgess". HHJ Burgess tried the case. HJ, you are a clown, you have been had over by your mate Richard Sanders. its not a judgement regardless of which Court it was in! Where is the Court Stamp!!!! It is a report written by Sanders Overpaid Solicitors patting themselves on the back for a completely pointless case. NO BENEFIT TO CUSTOMERS WHATSOEVER! Got to agree with the majority of posters who question your credibility and DRIVELTHEDEALS motives. Zero respect HJ especially when all you did was pick on one minor tecnicallity rather than deal with any of the extremely valid points but looking at all the other unanswered points its easy to see where you loyalties lie.......Is Richard Sanders of DTD your brother in law by any chance. ZERO CREDIBILITY FOR EITHER OF YOU HJ!!!!!!! Er, Factoryford. A County Court tries civil cases. A Crown Court tries criminal cases. HHJ Burgess who tried the case signed the transcript "Case report approved by HHJ Burgess". A little bird with inside information tells me Pendragon are behind this. Let's expose Messrs Robinson, Lorimer and Sanders for their shameful collusion against consumers. HJ-you are fully aware that car brokers keep the greedy main agents ever vigilant to the consumers benefit. HJ-look after the general public and not just your cronies! HJ your comments below are valid in part. V5's are transferred in this practice, it just takes a reasonable administrative period. During a change of keeper the DVLA themselves stipulate that the new keeper waits a least six weeks before contacting them if the new V5 has not been received. Are the DVLA breaking the law, if not define how long change of keeper might take before it becomes illegal. The defendant, it appears, was not in fact found guilty of anything, they in fact entered a guilty plea under pressure and possibly as a result of innocent ignorance( no defense but probably not malicious). What has has been shown unlawful is the failure of the defendant to inform customers that they may be committing an offense by not informing the DVLA that they are the regular keeper and that they should also inform their insurers that the vehicle will be registered to the provider in the first instance. So there you go consumers that's the risk, now you know, inform DVLA and tell your insurer that you will be the second recorded keeper. V5 retention is not illegal, misinformation is. Take a closer look at Drive the Deal, they do not appear to have the financial standing to employ one of the finest QC's in the country for a case which could have gone the wrong way for them. This looks like somebody has used a very big hammer to crack a very small nut, somebody who is looking to crush the practice of consumers saving money, possibly a very large dealer network and about these new car brokers, HJ I see is still happy to take the advertising revenue from these criminal masterminds. Drive the deal is held in very high regard on this web site,one of the last true gents, maybe but I don't really think so if he gets his kicks attempting to wipe out the competition. So HJ, in the UK the act of jay walking is illegal. Do we tell everybody not to cross the road or they'll be prosecuted or do we point out the crossing. I strongly suggest if you want your visitors to continue taking you seriously you need to take a much more impartial stance and distance yourself from DTD instead of polishing the pedestal you have them on. zero benefit to anyone least of all the car buying general public. have ever seen in my life. payers’ money clearly have more time than sense to bring such a case to court. and how meaningless it is in everyday terms to the average car buyer. ancient city walls, but only if he is carrying a bow and arrow. issues that actually matter to the car buying public. for Drivethedeal is receiving some very interesting hypotheses. Is this a Manufacturer attempting to fix prices? establish the facts rather than simply accept such flawed story. the key protagonists which to date seems to be Drivethedeal and Honest John. Who wins? Certainly not the car buying public! Judgement) get real and look at the big picture HJ. motivations of the main party Drivethedeal? hardly difficult to question their underlying motive and behaviour. Very interesting point about the "large dealer group" backing in this case. Just take a look at the last few years published accounts for Drive the Deal at Companies House, no way could they have afforded to risk bringing this case themselves. It could also be one last throw of the dice for them before the House of Cars Ltd ( t/a Drive the Deal ) comes tumbling down!